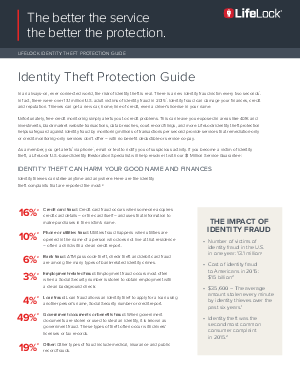 In an always-on, ever connected world, the risk of identity theft is real. There is a new identity fraud victim every two seconds. In fact, there were over 13.1 million U.S. adult victims of identity fraud in 20151. Identity fraud can damage your finances, credit and reputation. Thieves can get a new car, home, line of credit, even a driver’s license in your name. LifeLock identity theft protection helps safeguard against identity fraud by monitoring millions of transactions per second provide services that remediation-only or credit monitoring-only services don’t offer – with no benefit deductible or service co-pay.